Learn what the Melaleuca Foundation is doing for the Santa Lucia Children’s Home. Running to the Rescue: When disaster strikes, Melaleuca is on the scene. A Big Hug: Melaleuca received a touching gift from the Santa Lucia Children’s Home. A Helping Hand: Melaleuca has paid $7.5 million to non-profit organizations over the last three years. Since Melaleuca was founded in 1985, our mission has been “to enhance the lives of those we touch by helping people reach their goals.” By striving to fulfill that mission every day, we’ve been given so much. And we’re giving back. The Melaleuca Foundation was created as a charitable arm for Melaleuca to reach out and enhance the lives of those most in need. The Melaleuca Foundation was created in 2001 in the devastating aftermath of the September 11th attacks. The Foundation raised and donated more than $800,000 to aid several families and individuals who had fallen through the cracks after the tragedy and were in need of financial support. Since then, the Melaleuca Foundation has been helping people who, for whatever reason, are unable to help themselves. We’ve raised millions of dollars, donated millions of Melaleuca’s wellness products, collected thousands of tons of food, and provided supplies and additional aid to families in need across the globe. • Donated funds to help disaster relief in the United States, Canada, Mexico, Japan, the Philippines, Nepal and other countries. • Sent truckloads, planeloads and cargo ships full of supplies and Melaleuca products to help families whose lives were turned upside down by natural disasters. Specifically, we relieved suffering following Hurricanes Katrina, Rita, Harvey, Irma and Maria. • Delivered aid to wildfire victims in California, Colorado, Idaho and Tennessee. • Rebuilt lives after tornadoes hit the Midwest. • Provided support to families ravaged by floodwaters in Alberta and Louisiana. 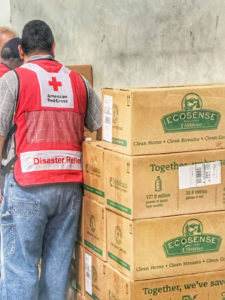 In addition to providing aid in times of natural disaster, Melaleuca has donated millions of dollars to support local and national nonprofit organizations including the American Red Cross, Salvation Army, United Way, Boy Scouts of America and more. Melaleuca’s charitable giving has been a blessing for literally millions of people across the globe. And for a special group of children at a small orphanage in Quito, Ecuador, it has defined their very lives. The Santa Lucia Children’s Home has been the signature cause of the Melaleuca Foundation since 2007. It is special and unique among the world’s orphanages. Instead of vast dormitories with rows of beds, there are small “homes” in which children live in loving, safe family units. Each child is provided with everything they need—all thanks to the Melaleuca Foundation and generosity of Preferred Members and Marketing Executives like you. "I believe in the Santa Lucia Children’s Home. I have been there, and I have worked closely with those who oversee it. I love those children. This is a great cause, and it needs our support. These children have food, clothing, shelter, and medical care. They have volunteer mothers watching over them. Most importantly, they have friendship, love, support, and hope. And now they have Melaleuca." Our signature cause, the Santa Lucia Children’s Home in Quito, Ecuador, is unlike any orphanage in the world. With a “run-to-the rescue” philosophy, Melaleuca continually answers the call in times of catastrophe. Filling empty stomachs: Melaleuca has donated thousands of tons of food in the fight against hunger. Brave men and women risk their lives every day for our safety and security. We are proud to support these heroes and their families. Melaleuca is passionate about improving education and providing future generations easier access to quality learning. In our own community and across the globe, there’s always someone in need of a lifeline, a helping hand or a second chance.